The story starts with Lathyrus odoratus, a plant which produces small bicoloured bluish-maroon and violet flowers with a wonderfully intense fragrance. It was first ‘discovered’ in Sicilian hedgerows, where it quietly perfumed the air as the Mafia marched by. The godfathers of yesteryear may not have noticed, but fortunately the clerics did. In 1695, one Father Francisco Cupani listed the sweet pea in his syllabus of plants newly discovered in Sicily. Then, in 1699, this good Sicilian sent seeds of this wild sweet pea to botanically inclined friends and correspondents all over Europe. One of those was Caspar Commelin at the botanic gardens in Amsterdam. His attention grabbed, he included a picture of the flowers in the catalogue of plants he published in 1701. This is the earliest botanical illustration of a sweet pea. Possibly the most significant of Cupani’s gardening friends was English plant collector Dr Robert Uvedale. He shared his seeds with a variety of enthusiasts, who set out to breed and improve the flower, and in 1724, the first sweet peas were released commercially. But despite initial interest, the fragrant flower was slow to be developed and by 1828 only about five varieties were grown. These included white, purple and ‘Painted Lady’ or pink-edged forms. Sweet peas are self-fertilising and, mutations aside, come true from seed. No cross-fertilisation occurs in the field, so it wasn’t until growers realised this and took steps to ensure cross-pollination took place that major advancements were possible. Enter pioneering Scottish gardener and “Sweet Pea king” Henry Eckford. He was working in the garden of the asylum at Sandywell Park in Shropshire when he began to hybridise sweet peas. He obtained seeds from the finest sweet peas of the day and began crossing varieties and selecting the best. His goal was to produce a sweet pea that would perform as a top cut flower – a richly scented one with long stems and large flowers in as wide a range of colours as possible. As the years rolled by, Eckford developed many new varieties of the large sweet peas he called ‘Grandifloras’. In 1882 he won his first award at a Royal Horticultural Society flower show – for a cultivar named ‘Bronze Prince’. Unfortunately, this was a fleeting triumph as the variety proved unstable and couldn’t be reproduced with any reliability. At the age of 65, Eckford set up his own business at Wem in Shropshire and devoted all his energy to the development of his Grandiflora sweet peas. By 1901, he’d developed 115 new cultivars – almost half of the sweet peas commercially available at the time. 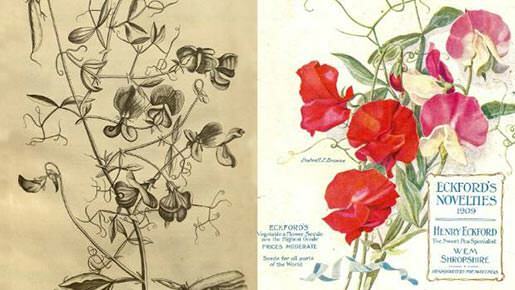 From left: Caspar Commelin’s sweet pea illustration (plantillustrated.org, Amoret Tan); A 20th-century catalogue by sweet pea specialist Henry Eckford. As if to celebrate the turn of the century, the beautiful ‘Countess Spencer’, noted for its large flowers and wavy-edged petals, made its debut. Reportedly developed by Silas Cole, who gardened for Earl Spencer at Althorp in Northamptonshire, this first Spencer sweet pea was more likely to have been a mutation than the result of deliberate breeding. Although Spencer sweet peas quickly became popular, their long stems and large flowers were often gained at the expense of fragrance. However, they captured the mood of the day, as the strait-laced Victorian era gave way to Edwardian frivolity. As sweet pea mania continued to grip the land, the National Sweet Pea Society (formed in England in 1901) set out to “restore order where there is something like chaos, an immense number of sorts with a still greater number of names”. The madness reached new heights in 1911 when Lord Northcliffe, owner of the Daily Mail, announced a competition. A then huge sum of £1000 was to be awarded to the amateur gardener who produced the best bunch of sweet peas; this bunch was to consist of 12 spikes and no fewer than four varieties. Second and third prize were £100 and £50 respectively – still a year’s salary for many at that time. The response was overwhelming. Some 38,000 bunches arrived at London’s Crystal Palace, where they were assessed by a small army of judges. After much deliberation, 2500 bunches were selected for display. The winning bunch, Mrs Fraser’s “gorgeous collection of scarlets, pinks, and purples, selected from ‘Paradise Carmine’, ‘Tom Bolton’, ‘Arthur Unwin’ and ‘Constance Oliver’, with enormous stems and great blooms two inches and more across” was grown by the Reverend Fraser, a minister in the Scottish Borders village of Sprouston. Fraser had sent two bunches on the train to London – one in his name and one in his wife’s (his came third, winning £50). Today the Daily Mail Cup is still competed for in the National Sweet Pea Society’s annual competition. Although Eckford’s son carried on the Wem seed business after his father’s death in 1905, it was the Unwin family who now came into prominence, raising new varieties and selling seeds. The Unwins have also been very influential in New Zealand. About 60 years ago, Pat Unwin bought land near Gisborne and started to bulk up new cultivars of sweet peas for the family firm. She and her daughter Bridget then trained a group of local women to join them in this exacting work. The venture is part of a major global shift. In the 21st century, it’s New Zealand, not Britain, that’s paramount in the sweet pea world. 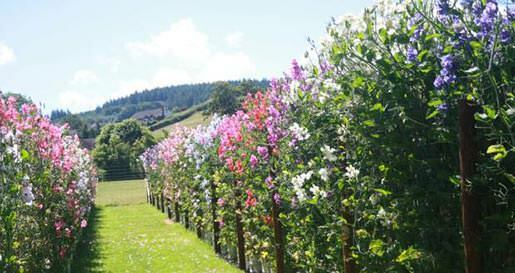 Some of the most exciting work in sweet pea breeding is carried out by noted Auckland plant breeder Dr Keith Hammett. Brought up in a garden-loving family close to London, Keith developed green thumbs at an early age. As a teen, he exhibited sweet peas, carnations and dahlias in London shows. In his early 20s, he caught the eye of experienced plantsmen and was asked to serve on the committee of the Sweet Pea Society. By age 25, he was on his way to New Zealand to work as a plant pathologist. Hammett has become one of the few professional breeders of ornamental plants in the world. It’s not a job for those in a hurry; he says, “You have to think in decades”. Although he approaches breeding from a scientific perspective, as a veteran of the exhibition world he realises that he’s fundamentally “a practitioner in the visual arts”. His achievements are the result of meticulous hard work, rather than happy accidents. His first project, to develop bicoloured sweet peas, involved crossing the best sweet peas of exhibition standard with the original Sicilian variety. Hammett wasn’t content, however. He felt that the bicoloured sweet peas lacked impact from a distance, as the wings were lighter than the standard petal in the centre of the flower. He identified a variety of culinary pea that was fundamentally a “reverse bicolour with a white standard petal and coloured wings”, and this inspired him to develop his first reverse bicolour. The pink and lilac ‘Leading Light’ was introduced in 2006. His next challenge was to use genes from Lathyrus belinensis (from Turkey) to develop a sweet pea with a much greater contrast between wing and standard colour. The recently released ‘Erewhon’, a highly scented cultivar with blue wings and lavender pink standards, is the happy outcome. Different types of sweet peas need different amounts of daylight. Keith says that the original wild sweet pea is summer flowering and requires about 12 hours a day for flowering to occur. 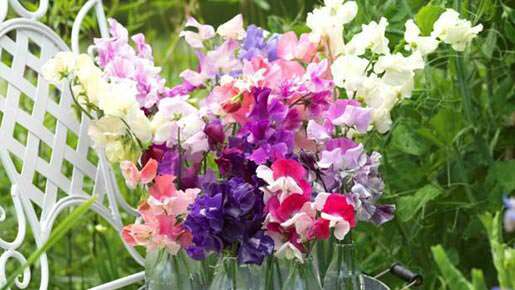 However, mutations have altered flowering time, so sweet peas can now be divided into summer-, spring- and winter-flowering strains. It’s important to work out which strain is likely to be suitable for your local conditions. Conversely, summer-flowering strains don’t do well where summer temperatures are high, because sweet peas quickly form seed and stop growing when it’s very hot. This is more likely to be a problem in Australia than in New Zealand. Over the years, Hammett has worked closely with Professor Brian Murray, a cytogeneticist at the University of Auckland. Together they’ve had many successes. One of Hammett’s highly perfumed cultivars, ‘High Scent’, is recognised as the world benchmark for fragrance. Hammett says he has always wanted to develop a yellow sweet pea. Hammett’s many years of work have literally changed the nature of the sweet pea so it’s no longer a pure species – and he has created many fantastic varieties along the way. Some of his cultivars are hybrids, styled Lathyrus x hammetti, that include genes from other species, and he’s exploring the consequences of introducing other genes. Small wonder that he’s recognised as the world’s leading breeder of this exceptional flower.